It can be frustrating when you don’t know what is going on with your IBM Maximo systems or aren’t aware of a problem until a user tells you about it. Too many organizations are forced to reactively manage their enterprise systems. For IBM Maximo, that is about to change. 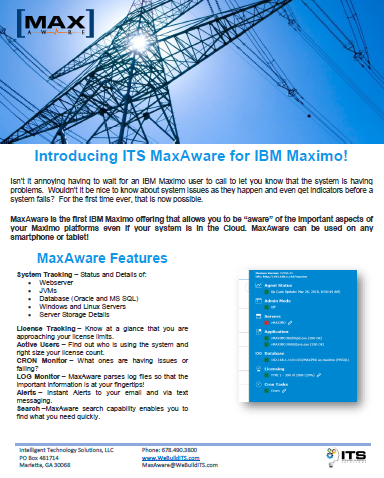 MaxAware is the first solution that makes you “aware” of important aspects of your IBM Maximo system. MaxAware notifies you when you there is an issue, allowing you to take action before it affects your users. Now you can proactively manage your IBM Maximo system, on-premises or in the cloud. And for a limited time, sign up for IBM Maximo services and get one year of MaxAware for free. MaxAware was built for Maximo System Administrators, corporate IT Administrators, and Managed Service Providers (MSPs) that monitor many systems. Administrators can gain insights into the IBM Maximo systems that they manage from anywhere: on their desktop, tablet, or phone. License Tracking – Know at a glance that you are approaching your license limits. Active Users – Find out who is using the system and right-size your license count. CRON Monitor – Which ones are having issues or failing? LOG Monitor – MaxAware parses log files so that the important information is at your fingertips! Alerts – Instant Alerts to your email and via text messaging. Search – MaxAware search capability enables you to find what you need quickly. 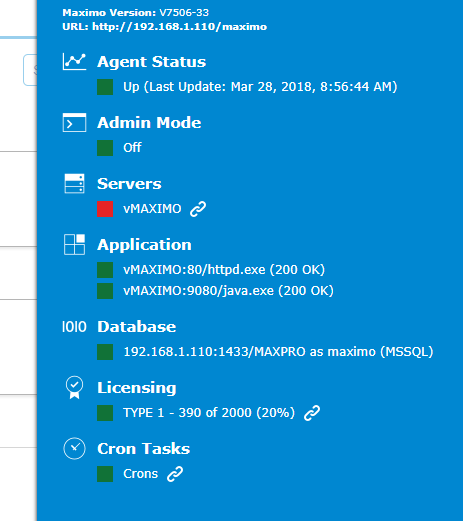 MaxAware gives you instant, detailed information on your servers, logs, CRONs, license information, active users, and more. You can dive deeper into all aspects of your IBM Maximo system. Always know what is going on with your system so you can make informed management decisions. With MaxAware you can securely access and interact with your IBM Maximo system from anywhere, from any device, without installing extra client software. What can you do with MaxAware? Turn Maximo Admin Mode on and off. Restart Java Virtual Machines (JVMs). Watch commands execute in real time through the Command Queue/Results window. Monitor active users and licenses so that you know if you need more licenses or less. MaxAware is a Cloud service that provides a single view into the important aspects of your Maximo instances from anywhere in the world. MaxAware is accessible through your browser on any device, so no client software is needed, and you can communicate with the server without opening special ports on your Firewall. Ready to take your IBM Maximo management to the next level? Click here to schedule a 25-minute tour of MaxAware today! Download the MaxAware product flyer below. Sign up for IBM Maximo services and get one year of MaxAware for free. MaxAware gives you insight into Maximo that you never had before and can save you time and money. Talk to our MaxAware experts at ITS today.